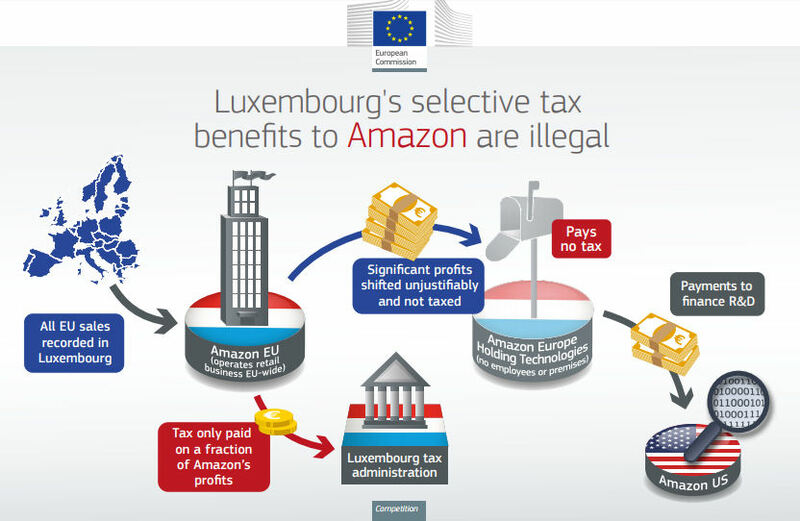 The European Commission (EC) has ruled that Luxembourg illegally let Amazon off €250 million of taxes and must now get them back, reports Telecoms.com (Banking Technology’s sister publication). This is the latest round of a general purge by the EC of European countries effectively bribing US tech companies to use them as their European hub by dangling the carrot of reduced taxes. Last year the EC ruled that Apple owed Ireland €13 billion in back taxes, on which more later. On one level this seems fair enough; why should big companies get special tax treatment? On the other hand you could argue that if a country wants to use the tax system to generate local jobs then that’s its business, so this comes down to a matter of sovereignty. But unless countries are going to take the brave step of leaving the EU then they have to put up with it. Here’s a handy infographic if you’re struggling to get your head around the matter. The EC has also piped up on the matter of Apple’s Irish billions, grassing Ireland up to the European Court of Justice (ECJ) for dragging its feet over the matter. Ireland politely disagreed with the original decision and accordingly doesn’t seem to have acted on it, hence the referral to the ECJ. While it’s safe to assume the phrase “feckin euro eejits” may have been uttered at subsequent Irish cabinet meetings, it’s hard to see what alternatives they have. This escalation by Europe, however, may at least give Ireland more legal weapons to use in its bid to recover the cash and it wouldn’t be surprising if the sanctions against Apple start ramping if it doesn’t make more of an effort to resolve the matter. Lastly, in other Ireland/ECJ news, the latter has been asked to rule on the case brought by Austrian lawyer Max Schrems, challenging the Safe Harbour/Privacy Shield system whereby US companies can transfer European data to the US. This specifically concerns Facebook which, by complete coincidence, is based in Ireland. We’ve no doubt it pays absolutely loads of tax there but Ireland has nonetheless asked the ECJ to make a ruling on the matter. ‘Tis the season for online shopping (and selling). One of the GAFA gang reveals its paytech plan. Are Amazon and Salesforce ditching Oracle? If you say mean things about the other children, they won't want to play with you. Looking to expand its lendtech programme for small businesses that sell on Amazon's websites.